For other uses, see Grief (disambiguation) and Griefing. Grief is a multifaceted response to loss, particularly to the loss of someone or something that has died, to which a bond or affection was formed. Although conventionally focused on the emotional response to loss, it also has physical, cognitive, behavioral, social, cultural, spiritual and philosophical dimensions. While the terms are often used interchangeably, bereavement refers to the state of loss, and grief is the reaction to that loss. Grief is a natural response to loss. It is the suffering one feels when something or someone the individual loves is taken away. The grief associated with death is familiar to most people, but individuals grieve in connection with a variety of losses throughout their lives, such as unemployment, ill health or the end of a relationship. Loss can be categorized as either physical or abstract, the physical loss being related to something that the individual can touch or measure, such as losing a spouse through death, while other types of loss are abstract, and relate to aspects of a person’s social interactions. 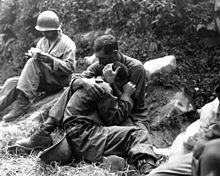 A grief-stricken soldier is comforted by a fellow soldier after a friend is killed in action during the Korean War. Track One is focused on the biopsychosocial functioning of grief. This focuses on the anxiety, depression, somatic concerns, traumatic responses, familial relationships, interpersonal relationships, self-esteem, meaning structure, work, and investment in life tasks. Rubin (2010) Points out, “Track 1, the range of aspects of the individuals functioning across affective, interpersonal, somatic and classical psychiatric indicators is considered”(Shimshon 686). All of the terms listed above are noted for the importance they have in relation to people’s responses to grief and loss. The significance of the closeness between the bereaved and the deceased is important to Track 1 because this could determine the severity of the mourning and grief the bereaved will endure. This first track is the response to the extremely stressful life events and requires adaption along with change and integration.The second track focuses on the ongoing relationship you have with the deceased. Track two mainly focuses on how the bereaved was connected to the deceased and on what level of closeness was shared. The stronger the relationship to the deceased is will lead to a greater evaluation of the relationship with heightened shock. Track two brings up both the positive and negative memories that you shared with the deceased and the degree of emotional involvement you shared causing reflection. Any memory could be a trigger for the bereaved, the way the bereaved chose to remember their loved one, and how the bereaved integrate the memory of their deceased into their daily lives. “in terms of functioning, this model can help the bereaved identify which areas of his/her life has been impacted by the grief in a negative way as well as areas that the bereaved has already begun to adapt to after the loss. If the bereaved is unable to return to their normal functioning as in before loss occurred, it is likely they will find difficulty in the process of working through the loss as well as their separation from the deceased. Along the relational aspect, the bereaved can become aware of their relationship with the deceased and how it has changed or may change in the future” (Williams & Haley, 2017). “The Two-Track Model of Bereavement can help specify areas of mutuality (how people respond affectivity to trauma and change) and also difference (how bereaved people may be preoccupied with the deceased following loss compared to how they may be preoccupied with trauma following the exposure to it)” (Rubin, S.S, 1999). Crying is a normal and natural part of grieving. It has also been found, however, that crying and talking about the loss is not the only healthy response and, if forced or excessive, can be harmful. Responses or actions in the affected person, called "coping ugly" by researcher George Bonanno, may seem counter-intuitive or even appear dysfunctional, e.g., celebratory responses, laughter, or self-serving bias in interpreting events. Lack of crying is also a natural, healthy reaction, potentially protective of the individual, and may also be seen as a sign of resilience. Science has found that some healthy people who are grieving do not spontaneously talk about the loss. Pressing people to cry or retell the experience of a loss can be damaging. Genuine laughter is healthy. Grief can be caused by the loss of one's home and possessions, as occurs with refugees. In Bonanno's book, The Other Side of Sadness: What the New Science of Bereavement Tells Us About Life After a Loss (ISBN 978-0-465-01360-9), he summarizes his research. His findings include that a natural resilience is the main component of grief and trauma reactions. The first researcher to use pre-loss data, he outlined four trajectories of grief. Bonanno's work has also demonstrated that absence of grief or trauma symptoms is a healthy outcome, rather than something to be feared as has been the thought and practice until his research. Because grief responses can take many forms, including laughter, celebration, and bawdiness, in addition to sadness, Bonanno coined the phrase "coping ugly" to describe the idea that some forms of coping may seem counter intuitive. Bonanno has found that resilience is natural to humans, suggesting that it cannot be "taught" through specialized programs and that there is virtually no existing research with which to design resilience training, nor is there existing research to support major investment in such things as military resilience training programs. The Kübler-Ross model, commonly known as the five stages of grief, is a theory first introduced by Elisabeth Kübler-Ross in her 1969 book, On Death and Dying. Based on the uncredited earlier work of John Bowlby and Colin Murray-Parkes, Kübler-Ross actually applied the stages to persons who were dying, not persons who were grieving. Her studies involved her work with the terminally ill. The popular but empirically unsupported model describes in five distinct stages how people deal with their impending death. The theory holds that the stages are a part of the framework that helps people learn to live without what they have lost. The stages model, which came about in the 1960s, is a theory based on observation of people who are dying, not people who experienced the death of a loved one. This model found limited empirical support in a study by Maciejewski et al. That is that the sequence was correct although Acceptance was highest at all points throughout the persons experience. The research of George Bonanno, however, is acknowledged as debunking the five stages of grief because his large body of peer-reviewed studies show that the vast majority of people who have experienced a loss are resilient and that there are multiple trajectories following loss. Other researchers such as Randolph Nesse have proposed that grief is a kind of psychological pain that orients the sufferer to a new existence without the deceased and creates a painful but instructive memory. If, for example, leaving an offspring alone at a watering hole led to the offspring’s death, grief creates an intensively painful memory of the event, dissuading a parent from ever again leaving an offspring alone at a watering hole. More recently, Winegard, Reynolds, Winegard, Baumeister, and Maner argued that grief might be a socially selected signal of an individual’s propensity for forming strong, committed relationships. From this social signaling perspective, grief targets old and new social partners, informing them that the griever is capable of forming strong social commitments. That is, because grief signals a person's capacity to form strong and faithful social bonds, those who displayed prolonged grief responses were preferentially chosen by alliance partners. The authors argue that throughout human evolution, grief was therefore shaped and elaborated by the social decisions of selective alliance partners. Bereavement, while a normal part of life, carries a degree of risk when severe. Severe reactions affect approximately 10% to 15% of people. Severe reactions mainly occur in people with depression present before the loss event. Severe grief reactions may carry over into family relations. Some researchers have found an increased risk of marital breakup following the death of a child, for example. Others have found no increase. John James, author of the Grief Recovery Handbook and founder of the Grief Recovery Institute, reported that his marriage broke up after the death of his infant son. "Bereavement" redirects here. For other uses, see Bereavement (disambiguation). Death of a child can take the form of a loss in infancy such as miscarriage or stillbirth or neonatal death, SIDS, or the death of an older child. In most cases, parents find the grief almost unbearably devastating, and it tends to hold greater risk factors than any other loss. This loss also bears a lifelong process: one does not get 'over' the death but instead must assimilate and live with it. Intervention and comforting support can make all the difference to the survival of a parent in this type of grief but the risk factors are great and may include family breakup or suicide. Even as a child grows older, death is still difficult to fathom and this affects how a child responds. For example, younger children see death more as a separation, and may believe death is curable or temporary. Reactions can manifest themselves in "acting out" behaviors: a return to earlier behaviors such as sucking thumbs, clinging to a toy or angry behavior; though they do not have the maturity to mourn as an adult, they feel the same intensity. As children enter pre-teen and teen years, there is a more mature understanding. Children can experience grief as a result of losses due to causes other than death. For example, children who have been physically, psychologically or sexually abused often grieve over the damage to or the loss of their ability to trust. Since such children usually have no support or acknowledgement from any source outside the family unit, this is likely to be experienced as disenfranchised grief. Relocations can cause children significant grief particularly if they are combined with other difficult circumstances such as neglectful or abusive parental behaviors, other significant losses, etc. Parents may grieve due to loss of children through means other than death, for example through loss of custody in divorce proceedings; legal termination of parental rights by the government, such as in cases of child abuse; through kidnapping; because the child voluntarily left home (either as a runaway or, for overage children, by leaving home legally); or because an adult refuses or is unable to have contact with a parent. This loss differs from the death of a child in that the grief process is prolonged or denied because of hope that the relationship will be restored. Grief may occur after the loss of a romantic relationship (i.e. divorce or break up), a vocation, a pet (animal loss), a home, children leaving home (empty nest syndrome), sibling(s) leaving home, a friend, a faith in one's religion, etc. A person who strongly identifies with their occupation may feel a sense of grief if they have to stop their job due to retirement, being laid off, injury, or loss of certification. Those who have experienced a loss of trust will often also experience some form of grief. Many people who grieve do not need professional help. Some, however, may seek additional support from licensed psychologists or psychiatrists. And support resources available to the bereaved may include grief counseling, professional support-groups or educational classes, and peer-led support groups. In the United States of America, local hospice agencies may provide a first contact for those seeking bereavement support. Support groups for bereaved individuals follow a diversity of patterns. Many are organized purely as peer-to-peer groups such as local chapters of the Compassionate Friends, an international group for bereaved parents. Other grief support groups are led by professionals, perhaps with the assistance of peers. Our House is a non-profit Grief Support Center located in Southern California that specifically helps children heal from the loss of a parent, sibling, or close relative. It hosts several programs, support groups, and camps to give individuals the space needed to grieve. Camp Erin takes place bi-annually and volunteers do crafts with children. This is also an opportunity for children to meet other children in similar situations. The Compassionate Friends – support group for bereaved parents, siblings and grandparents. National organisations in most English-speaking countries, with comprehensive system of local groups. Stillbirth and Neonatal Death Society (SANDS) - runs a UK-wide network of local support groups. In August Friedrich Schenck's 1878 painting Anguish, held at the National Gallery of Victoria, a grieving ewe mourns the death of her lamb. Previously it was believed that grief was only a human emotion, but studies have shown that other animals have shown grief or grief-like states during the death of another animal, most notably Elephants, wolves, apes, and goats. This can occur between bonded animals which are animals that attempt to survive together (i.e. a pack of wolves or mated prairie voles). Mammals have demonstrated grief-like states, especially between a mother and her offspring. She will often stay close to her dead offspring for short periods of time and may investigate the reasons for the baby's non-response. For example, some deer will often sniff, poke, and look at its lifeless fawn before realising it is dead and leaving it to rejoin the herd shortly afterwards. Other animals, such as a lioness, will pick up its cub in its mouth and place it somewhere else before abandoning it. When a baby chimpanzee or gorilla dies, the mother will carry the body around for several days before it may finally be able to move on without it; this behavior has been observed in other primates, as well. Jane Goodall has described chimpanzees as exhibiting mournful behavior toward the loss of a group member with silence and by showing more attention to it. And they will often continue grooming it and stay close to the carcass until the group must move on without it. Another notable example is Koko, a gorilla that uses sign language, who expressed sadness and even described sadness about the death of her pet cat, All Ball. Elephants, have shown unusual behavior upon encountering the remains of another deceased elephant. They will often investigate it by touching and grabbing it with their trunks and have the whole herd stand around it for long periods of time until they must leave it behind. It is unknown whether they are mourning over it and showing sympathy, or are just curious and investigating the dead body. Elephants are thought to be able to discern relatives even from their remains. An episode of the acclaimed BBC Documentary Life on Earth shows this in detail – the elephants, upon finding a dead herd member, pause for several minutes at a time, and carefully touch and hold the dead creature's bones. Some birds seem to lack the perception of grief or quickly accept it- for example, Mallard hens, although shocked for a moment when losing one of their young to a predator, will soon return to doing what they were doing before the predator attacked. However, some other waterbirds, such as Mute swans, are known to grieve for the loss of a partner or cygnet, and are known to engage in pining for days, weeks or even months at a time. Another form of grief in animals is when an individual loses its mate; this can be especially brutal when the species is monogamous. So when a pair bonding species, such as a black-backed jackal, loses its mate it can be very difficult for it to detach itself from its dead mate. ^ America, H. F. (2012). Grief. Retrieved March 15, 2012, from Hospice Foundation of America: "Hospice Foundation of America - Home". Archived from the original on 2012-03-19. Retrieved 2012-03-20. ^ Rubin, Simon Shimshon; Bar Nadav, Ofri; Malkinson, Ruth; Koren, Dan; Goffer-Shnarch, Moran; Michaeli, Ella (2009). "The Two-Track Model of Bereavement Questionnaire (TTBQ): Development and Validation of a Relational Measure". Death Studies. 33 (4): 305–333. doi:10.1080/07481180802705668. PMID 19368062. ^ Williams, Litza; Haley, Eleanor (2017-01-12). "Understanding The Two-Track Model of Bereavement - What's Your Grief". What's Your Grief. Retrieved 2017-12-11. ^ Rubin, Simon Shimshon (1999). "The Two-Track Model of Bereavement: Overview, Retrospect, and Prospect". Death Studies. 23 (8): 681–714. CiteSeerX 10.1.1.462.2673. doi:10.1080/074811899200731. PMID 10848088. ^ a b c d e f g Bonanno, George A. (2004). "Loss, Trauma, and Human Resilience: Have We Underestimated the Human Capacity to Thrive After Extremely Aversive Events?". American Psychologist. 59 (1): 20–8. doi:10.1037/0003-066X.59.1.20. PMID 14736317. ^ a b c d e Stix, Gary (2011). "The Neuroscience of True Grit". Scientific American. 304 (3): 28–33. doi:10.1038/scientificamerican0311-28. PMID 21438486. ^ a b c "Dance, Laugh, Drink. Save the Date: It's a Ghanaian Funeral". The New York Times. 12 April 2011. ^ "The Irish Wake Tradition - Exploring Irish Wakes". 2012-02-13. ^ MacIejewski, P. K.; Zhang, B.; Block, S. D.; Prigerson, H. G. (2007). "An Empirical Examination of the Stage Theory of Grief". JAMA: The Journal of the American Medical Association. 297 (7): 716–23. doi:10.1001/jama.297.7.716. PMID 17312291. ^ O'Connor, Mary-Frances; Irwin, Michael R.; Wellisch, David K. (2009). "When grief heats up: Pro-inflammatory cytokines predict regional brain activation". NeuroImage. 47 (3): 891–6. doi:10.1016/j.neuroimage.2009.05.049. PMC 2760985. PMID 19481155. ^ Freed, Peter J.; Yanagihara, Ted K.; Hirsch, Joy; Mann, J. John (2009). "Neural Mechanisms of Grief Regulation". Biological Psychiatry. 66 (1): 33–40. doi:10.1016/j.biopsych.2009.01.019. PMC 2782609. PMID 19249748. ^ Archer, J. (1999). The nature of grief: The evolution and psychology of reactions to loss. London, England: Routledge. ^ Nesse, R. M. (2005). An evolutionary framework for understanding grief. In D. Carr, R. M. Nesse, & C. B. Wortman (Eds. ), Late life widowhood in the United States: Spousal bereavement in late life (pp. 195-226). New York, New York: Springer. ^ Winegard B. M.; Reynolds T.; Baumeister R. F.; Winegard B.; Maner J. K. (2014). "Grief functions as an honest indicator of commitment". Personality and Social Psychology Review. 18 (2): 168–186. doi:10.1177/1088868314521016. PMID 24501093. ^ Bunch, J.; Barraclough, B.; Nelson, B.; Sainsbury, P. (1971). "Suicide following bereavement of parents". Social Psychiatry. 6 (4): 193. doi:10.1007/BF00578368. ^ Lichtentahl, W. G.; Cruess, D.G. (2010). "Effects of Directed Written disclosure on Grief and Distress symptoms among bereaved individuals". Death Studies. 34 (6): 475–499. doi:10.1080/07481187.2010.483332. PMC 3909885. PMID 24482856. ^ a b Allen Frances (August 14, 2010). "Good Grief". The New York Times. ^ Wakefield, Jerome C (2012). "Should prolonged grief be reclassified as a mental disorder in DSM-5? : reconsidering the empirical and conceptual arguments for complicated grief disorder". The Journal of Nervous and Mental Disease. 200 (6): 499–511. doi:10.1097/NMD.0b013e3182482155. PMID 22652615. ^ Bonanno, George A. (2006). "Is Complicated Grief a Valid Construct?". Clinical Psychology: Science and Practice. 13 (2): 129. doi:10.1111/j.1468-2850.2006.00014.x. ^ Shear, K. (2005). "Treatment of Complicated Grief: A Randomized Controlled Trial". JAMA: The Journal of the American Medical Association. 293 (21): 2601–8. doi:10.1001/jama.293.21.2601. PMC 5953417. PMID 15928281. ^ Newson, Rachel S.; Boelen, Paul A.; Hek, Karin; Hofman, Albert; Tiemeier, Henning (2011). "The prevalence and characteristics of complicated grief in older adults". Journal of Affective Disorders. 132 (1–2): 231–8. doi:10.1016/j.jad.2011.02.021. PMID 21397336. ^ a b c Rosenzweig, Andrew; Prigerson, Holly; Miller, Mark D.; Reynolds, Charles F. (1997). "Bereavement and Late-Life Depression: Grief and Its Complications in the Elderly". Annual Review of Medicine. 48: 421–8. doi:10.1146/annurev.med.48.1.421. PMID 9046973. ^ For a true account of one couples' experience with the stillbirth of their baby, see Brad Stetson, Tender Fingerprints: A True Story of Loss and Resolution, (Grand Rapids, Michigan: Zondervan, 1999). ^ maple, M; Edwards, H; Minichello V (May 2010). "Silenced Voices: hearing the stories of parents bereaved through suicide death of a young adult child". Health and Social Care in the Community. 18 (3): 241–248. doi:10.1111/j.1365-2524.2009.00886.x. PMID 19793388. ^ See Gerald Rochelle, Goodbye: grief from beginning to end, Cambridge House, 2013. ^ Ellis, J; Lloyd-Williams, M (July 2008). "Perspectives on the impact of early parent loss in adulthood in the UK: narratives provide the way forward". European Journal of Cancer Care. 17 (4): 317–318. doi:10.1111/j.1365-2354.2008.00963.x. PMID 18638179. ^ Marshall, H (2004). "Midlife loss of parents: The Transition from Adult Child to Orphan". Ageing International. 29 (4): 351–367. doi:10.1007/s12126-004-1004-5. ^ "Grieving the Loss of a Sibling". ^ P. Gill White, Ph.D., “Loss of an Adult Sibling” online at http://www.counselingstlouis.net/page22.html. Accessed September 7, 2015. ^ P. Gill White, Sibling Grief: Healing After the Death of a Sister or Brother (iUniverse, 2006), 47. ^ Cerel, Julie; Fristad, Mary A.; Verducci, Joseph; Weller, Ronald A.; Weller, Elizabeth B. (2006). "Childhood Bereavement: Psychopathology in the 2 Years Postparental Death". Journal of the American Academy of Child & Adolescent Psychiatry. 45 (6): 681–90. doi:10.1097/01.chi.0000215327.58799.05. PMID 16721318. ^ Ainsworth, Mary D. Salter; Bell, Silvia M. (1970). "Attachment, Exploration, and Separation: Illustrated by the Behavior of One-Year-Olds in a Strange Situation". Child Development. 41 (1): 49–67. doi:10.2307/1127388. JSTOR 1127388. PMID 5490680. ^ Sheppard, Caroline H.; Steele, William (2003). "Moving Can Become Traumatic". Trauma and Loss: Research and Interventions. Nat'l Inst for Trauma and Loss in Children. Archived from the original on May 7, 2009. Retrieved 22 January 2010. ^ Oesterreich, Lesia (April 2004). "Understanding children: moving to a new home" (PDF). Iowa State University. Retrieved 22 January 2010. ^ Leek Openshaw, L (April 2011). "School-based support groups for traumatized students". School Psychology International. 32 (2): 163–178. doi:10.1177/0143034311400830. ^ John W. James and Russell Friedman, The Grief Recovery Handbook, 20th Anniversary Expanded Edition (William Morrow Paperbacks, 2009), 5. ^ “The Gradual Grief of Alzheimer's” in Christianity Today, 48:2 (Feb 2004). Online at http://www.christianitytoday.com/ct/2004/february/8.64.html. ^ Kara Tippetts, “By Degrees-Living and Dying” on “Mundane Faithfulness” at http://www.mundanefaithfulness.com/2014/12/29/by-degrees-living-and-dying. Accessed June 5, 2015. ^ Milton Crum, “Bereavement: Long Term” online at http://www.ahpcc.org.uk/wp-content/uploads/milton-crum---bereavement.pdf, the website of the Association of Hospice and Palliative Care Chaplains in the UK. Accessed August 7, 2015. ^ Milton Crum, “I’m Old,” 53. Online in the Virginia Theological Seminary Bishop Payne Library at http://www.vts.edu/ftpimages/95/download/Milton%20Crum%20I%20AM%20OLD%202011%5B4%5D_resources.pdf. ^ ”Finding Grief Support That is Right for You” at http://www.griefhealingblog.com/2010/04/finding-grief-support-that-is-right-for.html. Accessed September 5, 2015. ^ “Interim Hospice Bereavement and Grief” at http://www.interimhealthcare.com/services/hospice/bereavement-services. Accessed September 5, 2015. ^ van der Hart, Onno; Brown, Paul; Turco pages 263-271, Ronald N. (1990). "Hypnotherapy for Traumatic Grief: Janetian and Modern Approaches Integrated". American Journal of Clinical Hypnosis. 32 (4): 263–271. doi:10.1080/00029157.1990.10402833. PMID 2186612. ^ Hart, O.; Brown, P.; Turco, R.N. (April 1989). "Hypnotherapy for Traumatic Grief: Janetian and modern approaches integrated" (PDF). American Journal of Clinical Hypnosis. 32 (4): 1–6. ^ Lichtenthal, W.G. ; Cruess D.G. (2010). "Effects of Directed Written Disclosure on Grief and Distress symptoms among Bereaved individuals". Death Studies. 34 (6): 475–499. doi:10.1080/07481187.2010.483332. PMC 3909885. PMID 24482856. ^ Hoy, William G. (2016). Bereavement Groups and the Role of Social Support: Integrating Theory, Research, and Practice. New York, NY: Routledge. ISBN 978-1138916890. ^ "Main Page". Our House Grief Support Center. Retrieved 2016-10-28. ^ McRitchie, R., McKenzie, K., Quayle, E., Harlin, M., Neumann, K. (2014). How adults with intellectual disability experience bereavement and grief: a qualitative exploration. Death Studies, 38(3), 179-185. ^ Gilrane-McGarry, U., Taggart, L. (2007). An exploration of the support received by people with intellectual disabilities who have been bereaved. Journal of Research in Nursing, 12(2), 129-144. ^ McEvoy, J., Smith, E. (2005). Families perceptions of the grieving process and concept of death in individuals with intellectual disabilities. British Journal of Developmental Disabilities, 51(100, pt.1), 17-25. ^ Clute, M. (2010). Bereavement interventions for adults with intellectual disabilities: what works. Omega: Journal of Death and Dying, 61(2), 163-177. Black, H. K.; Santanello, H. R. (2012). "The Salience of Family Worldview in Mourning an Elderly Husband and Father". The Gerontologist. 52 (4): 472–483. doi:10.1093/geront/gnr148. PMC 3391382. PMID 22241808. Newson, Rachel S.; Boelen, Paul A.; Hek, Karin; Hofman, Albert; Tiemeier, Henning (2011). "The prevalence and characteristics of complicated grief in older adults". Journal of Affective Disorders. 132 (1–2): 231–8. doi:10.1016/j.jad.2011.02.021. PMID 21397336. This page was last edited on 7 April 2019, at 22:07 (UTC).